Clark Terry’s career in jazz spans more than sixty years. He is a world-class trumpeter, flugelhornist, educator, and NEA Jazz Master. He performed for seven U.S. Presidents, and was a Jazz Ambassador for State Department tours in the Middle East and Africa. More than fifty jazz festivals in all seven continents still feature him. He received a Grammy Award, two Grammy certificates, three Grammy nominations, thirteen honorary doctorates, keys to cities, lifetime achievements and halls of fame awards. He was knighted in Germany and is the recipient of the French Order of Arts and Letters. Clark’s star on the Walk of Fame, and his Black World History Museum’s life-sized wax figure can both be visited in his hometown, St. Louis, Missouri. Clark composed more than two hundred jazz songs, and his books include Let’s Talk Trumpet: From Legit to Jazz, Interpretation of the Jazz Language and Clark Terry’s System of Circular Breathing for Woodwind and Brass Instruments. He recorded with The London Symphony Orchestra, The Dutch Metropole Orchestra, The Duke Ellington Orchestra and The Chicago Jazz Orchestra, at least thirty high school and college ensembles, his own duos, trios, quartets, quintets, sextets, octets, and two big bands — Clark Terry’s Big Bad Band and Clark Terry’s Young Titans of Jazz. His career as both leader and sideman with more than three hundred recordings demonstrates that he is one of the luminaries in jazz. Clark’s discography reads like a “Who’s Who In Jazz,” with personnel that includes great jazz artists such as Duke Ellington, Count Basie, Quincy Jones, Ella Fitzgerald, Oscar Peterson, Dizzy Gillespie, Dinah Washington, Ben Webster, Charlie Barnet, Doc Severinsen, Ray Charles, Billy Strayhorn, Dexter Gordon, Thelonious Monk, Billie Holiday, Sarah Vaughn, Coleman Hawkins, Zoot Sims, Milt Jackson, Bob Brookmeyer, Jon Faddis, and Dianne Reeves. 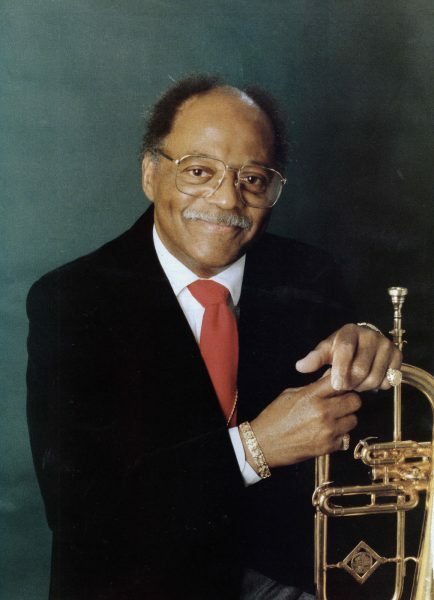 “Clark Terry,” writes Chuck Berg, “is one of contemporary music’s great innovators, and justly celebrated for his great technical virtuosity, swinging lyricism, and impeccable good taste. Combining these with the gifts of a great dramatist, Clark is a master storyteller whose spellbinding musical ‘tales’ leave audiences thrilled and always awaiting more. 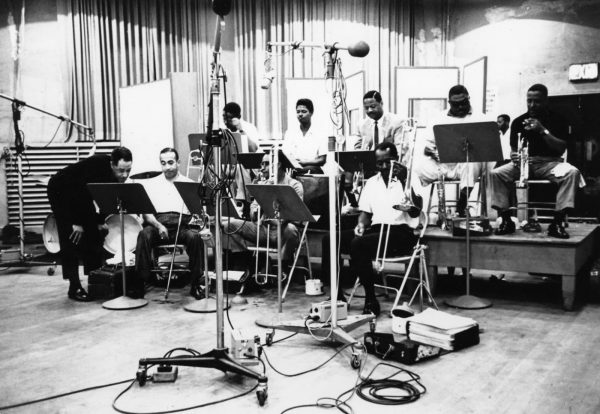 Following a tour with Harold Arlen’s “Free and Easy” show directed by Quincy Jones in 1960, Clark’s international recognition soared when he accepted an offer from the National Broadcasting Company to become its first African American staff musician. Soon after, Clark became a ten year television star as one of the spotlighted players in the Tonight Show band where he scored a smash hit as a singer with his irrepressible “Mumbles.” From the 70’s through the 90’s, Clark performed at Carnegie Hall, Town Hall, and Lincoln Center, toured with the Newport Jazz All Stars and Jazz at the Philharmonic, and he was featured with Skitch Henderson’s New York Pops Orchestra. Since 2000, he hosts Clark Terry Jazz Festivals on land and sea, and his own jazz camps. Prompted early in his career by Dr. Billy Taylor, Clark and Milt Hinton bought instruments for and gave instruction to young hopefuls which planted the seed that became Jazz Mobile in Harlem. This venture tugged at Clark’s greatest love – involving youth in the Perpetuation of Jazz. Between global performances, Clark continues to share wholeheartedly his jazz expertise and encourage students. That teaching has involved William Paterson since the development of this archive, where Prof. Terry continues to spend time on campus each semester, teaching master classes, ensembles and performing concerts with WP jazz studies majors. He and his wife Gwen continue to be closely involved in the creation and maintenance of this Archive.